Before now, the longest I’ve lived in any one house was seven years at one childhood home; the longest I stayed at one job was ten years, and that was probably for three years too long. Now, as we’re in Year Eight at our current location, I fantasize about new adventures, new starts, new homes, new places to explore. I dream of vacations and uprooting because we happen upon a gem of a property that’s too “us” to pass up. I’m antsy. I would love to live on the beach or in Canada or on a beach in Canada. I would love to move back east. A new home sounds swell. This may be because I don’t feel like cleaning the one I currently live in. 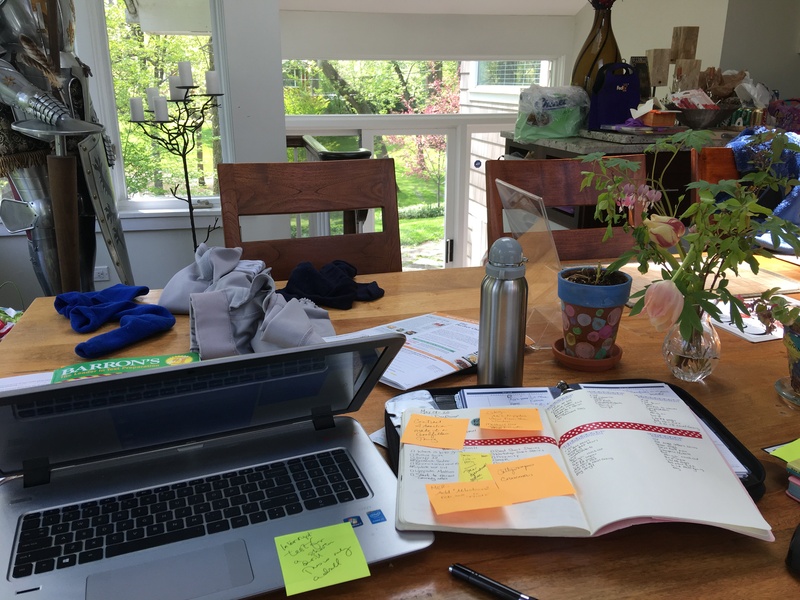 I was out of commission earlier this month, so my already tenuous relationship with home tidying had its status temporarily changed to “it’s complicated.” I’m now up and about, but there are some issues to tackle. You can’t necessarily tell from this picture how gross the shelves are. They are lousy with spilled food, congealed drinks, and I dunno, gremlin sputum, probably. Up there on the top shelf, a container of strawberries precariously balances on an empty container of Spinach Artichoke Parmesan Dip. I suppose I could scrape a Wheat Thin in there and clear it out completely, but honestly, this is like not changing the toilet paper when there is only one square remaining on the roll. And then balancing strawberries on top of it. 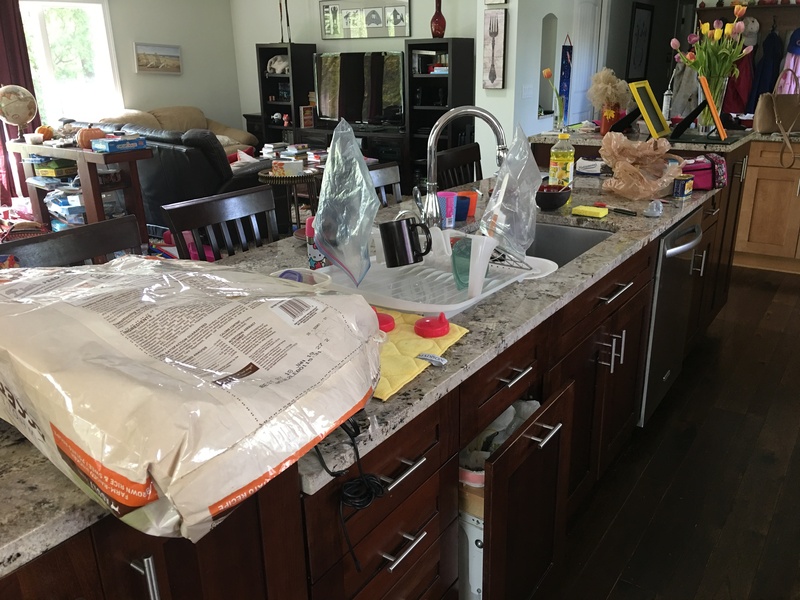 On the left, you’ll notice two pots being used as food storage containers. Not only is this counter to good storage and space usage (I mean, c’mon, my generation was raised on Tetris — there is no excuse for this) but also now I have no pots to cook with. Or to piss in, if I did that sort of thing. Maybe that’s what on the bottom of the shelves. 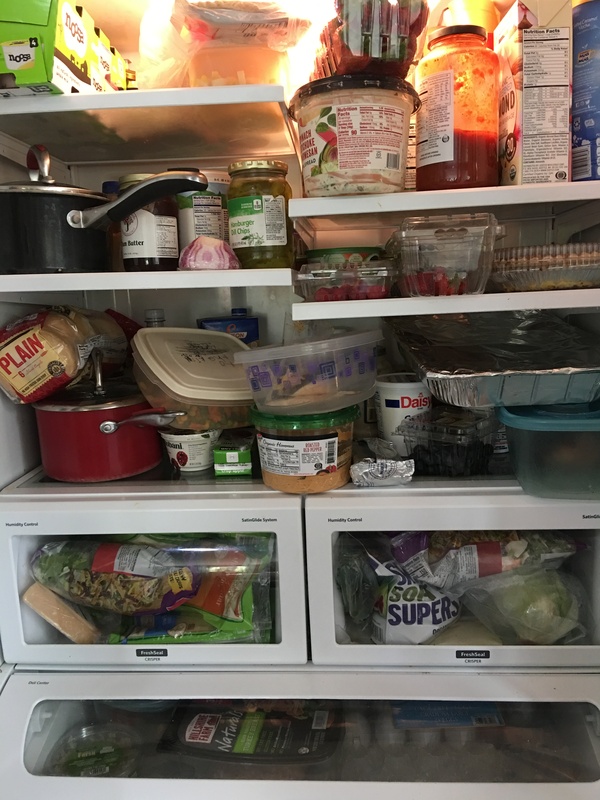 Do you see the Tupperware next to the red pot on the bottom shelf there, the one that is like the Leaning Tower of Peas and Carrots? God help anyone who wants the yogurt beneath. There is, in the pull out drawer on the right, a Costco-size bag of dates. No one in my house likes dates other than my husband. He thinks, somehow, by purchasing the giant bag, we might get pulled into the giant undertow of the bag and somehow like them. He is wrong. This bag is 10 months old and pretty much full. In the bottom left of the bottom pull out drawer rests a container of pre-chopped onions, translucent from age. Which is good because I’m supposed to saute them until translucent anyway. My long weekend plans include cleaning out the fridge and dissuading my husband from shopping. Bless. This was my kitchen the day I really felt up to walking around. That mammoth bag in the foreground once held twenty-five pounds of dog food. It now holds zero pounds of dog food because the bag leaked. There are dishes and bags and whatnot everywhere. It’s exhausting to the point of my needing some sort of fainting couch. I tried going to the store as though my brain were fully functioning and was thrilled to find a cleaner I could use in my kitchen whose scent I like. Only after I got home did I realize that it’s glass cleaner. Which I most decidedly do not need right now. 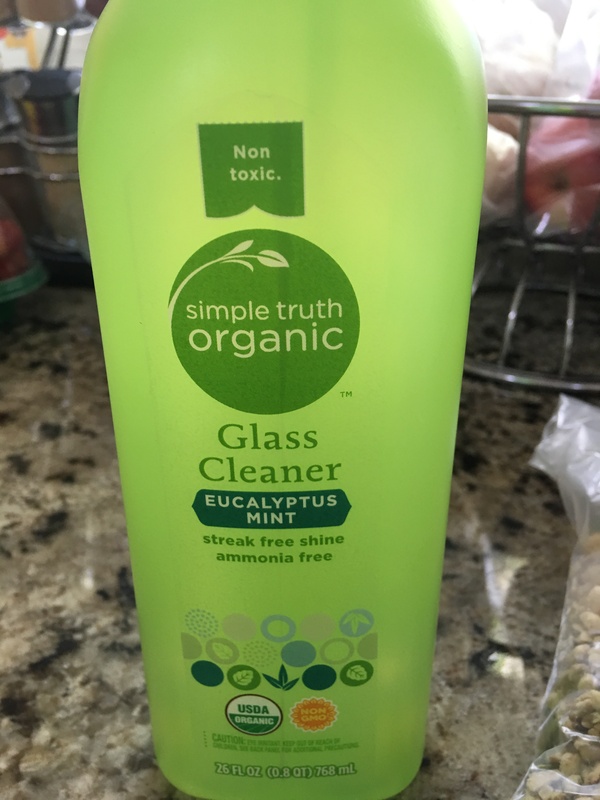 My husband also purchases glass cleaner at Costco. I think it’s next to the dates. Here is my workspace/kitchen table because my office is still in shambles from the flood a few weeks ago. I share my desk with dying plants and my boys’ baseball uniforms as I work to the sound of someone chopping down tree branches because around here someone is always chopping down tree branches. But for now, instead of cleaning or serving up leftovers garnished with dates, I’m staring at pictures of Demark and Iceland and other that may or may not have beaches but which probably have full containers of dip, possible entire pots of the stuff.